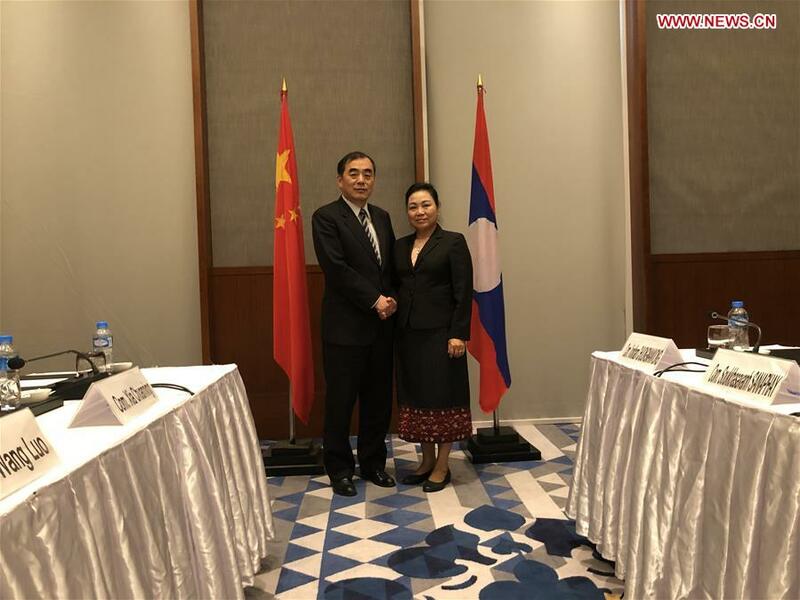 VIENTIANE, March 25 (Xinhua) -- Visiting Chinese Vice Foreign Minister Kong Xuanyou and Lao Vice Foreign Minister Khampao Ernthavanh have held diplomatic consultations and exchanged views on bilateral relations as well as regional and international issues of common concern. During their meeting in northern Lao city Luang Prabang on Sunday, Kong Xuanyou said that under the guidance and the impetus of the top leaders of the two parties and the two countries, China-Laos relations have achieved leaping development. Noting that this year marks the 10th anniversary of the establishment of the comprehensive strategic cooperative partnership between China and Laos, Kong said both sides should continue to implement the important consensus reached by the top leaders of the two parties and the two countries, closely coordinate strategic communication, deepen cooperation in various fields, and strengthen coordination and cooperation in the international and regional affairs so as to make preparation for the upcoming high-level meetings between the two countries and to continuously push forward the development of bilateral ties. For his part, Khampao said that Laos and China are good neighbours, good friends, good comrades and good partners. The leaders of the two parties and the two countries have made the strategic decision to build a community of shared future between Laos and China, and have pointed out the direction for the development of the comprehensive strategic cooperative partnership in the new era, Khampao said. The Lao side is willing to continue to increase high-level communication with China, push forward the construction of key projects including the Laos-China Economic Corridor and the Laos-China Railway, encourage people-to-people exchanges, and to carry forward the traditional friendship between the two countries, Khampao said.